Dr. Nicole J Sim, O.D. ​Dr. Nicole Sim attended UC Berkeley for her undergraduate degree in Molecular Cell Biology. She also holds a Bachelor of Science degree in Vision Science. Dr. Sim graduated from the UC Berkeley School of Optometry, receiving the Dean’s Award for her thesis. 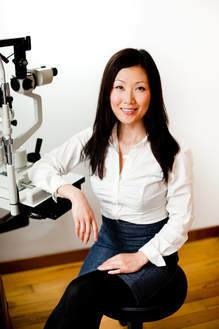 Dr. Sim has diverse experience in the treatment of eye conditions and diseases. She was trained in various clinics such as a retinal specialty clinic, a low income trauma center and a vision training center for children. She has extensive experience in LASIK co-management, primary care optometry and dry eye treatment, along with other ocular diseases. Dr. Sim understands and values the important role of a primary care optometrist in taking care of not just patients’ eyes but their overall health as well. When Dr. Sim is not taking care of her patients, she loves to travel the world with her husband. She also loves to practice yoga with her friends and to experience some of the many wonders the Bay Area has to offer, such as its many amazing restaurants, cultural events, and nature.